I’m still don’t have all the information for the pelvis, but I decided to start doing it anyway. My only source are the images of SMNK PAL 1137 from the article by Eck et al, which are in black and white, low resolution and have at most two views of each bone. 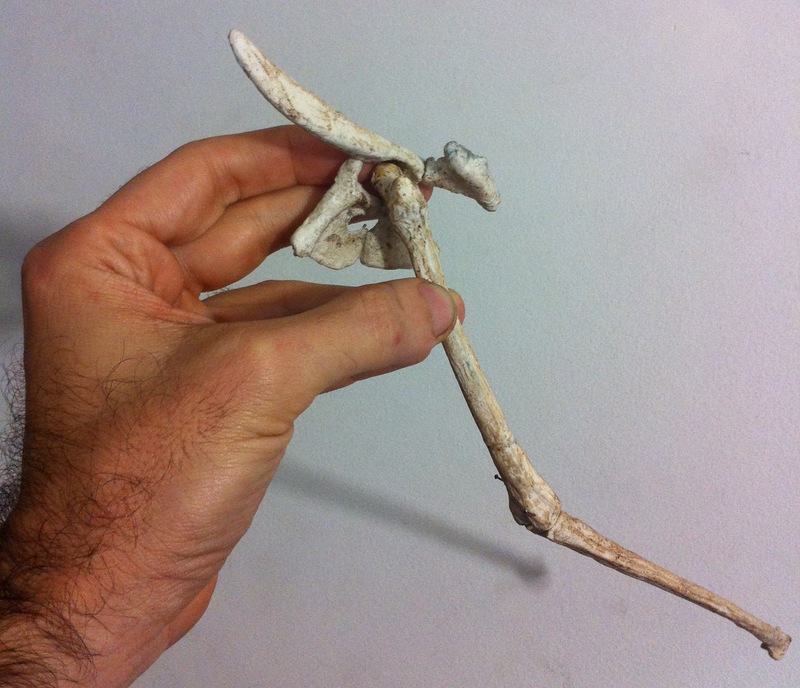 I will have to use what I know about other pterosaurs to make it three-dimensional. I started cutting out the parts in scale (the scale is another big problem – I based my choice on information from paleontologists since the scales in the article are not reliable). 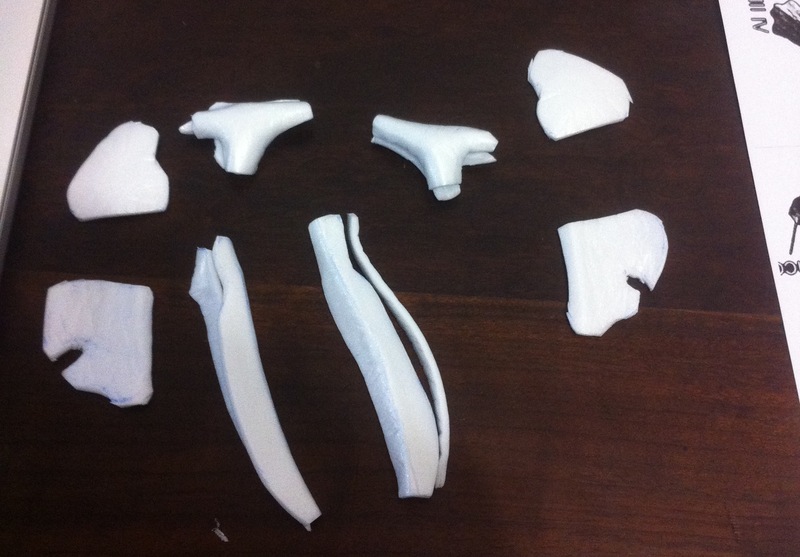 Then I folded and tried to shape each bone trying to guess the depth of its three-dimensionality from the shadows. I also used as references all I learned about pterosaur pelves so far, but I never made one from the individual bones before. This is a prototype. The pelvic bones are actually a set of four bones on each side forming the pterosaur’s hips. It’s supposed to look something like this. The long one on the left is the ilium (the long part of the ilium is actually called the preacetabular process). On the right, above is the postacetabular process. The depression near the right side of the ilium, which forms a circular shape if you consider the other two bones below is the acetabulum. That’s where the femur will articulate. At the lower left is the pubis and at lower right, the ischium. The point where the ilium, pubis and ischium fuse together is the acetabulum. Here I added some more detail, did some fire shaping and coffee-staining. It’s still a prototype for testing (I might change it or throw it away after I use it). You can see better now the three-dimensional aspect of the ilium, showing the acetabular depression, and the medial side of the postacetabular process. The process I used to make the femora and tibiae is the same I used for the other long bones (humeri, ulnae, etc) so I won’t detail them here. 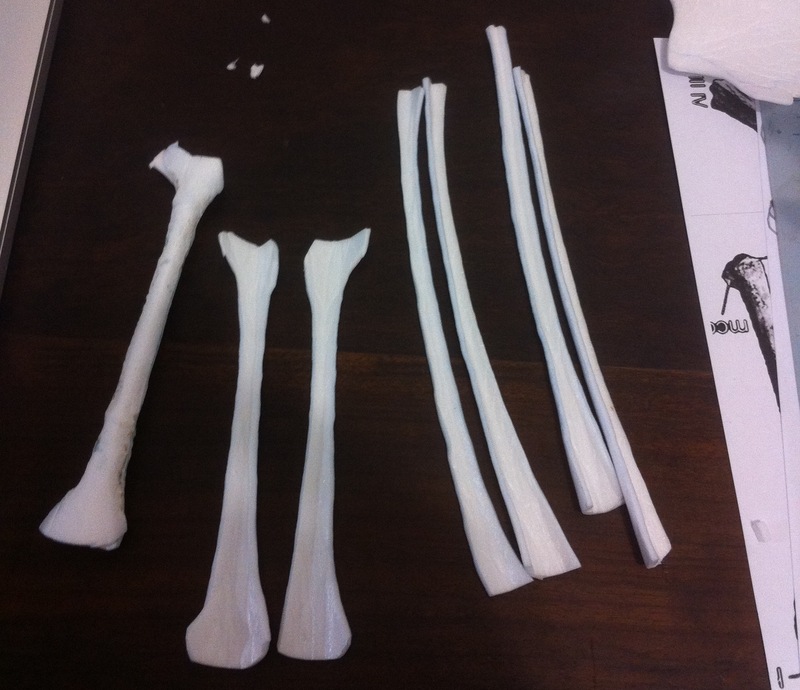 This is a picture of the strips of foam I used to make the bones of the legs. One of the femora is already with its halves glued in place. The tibia is actually a set of four bones called the tibiotarsus. It contains the tibia itself, the fibula (a very thin bone fused to one of the sides of the tibia, starting at the proximal end and not reaching the distal end), the calcaneum and astragalus which are actually part of the feet (they are the proximal tarsi which function as hinges for the feet). The picture below shows the tibia-fibula and the calcaneum-astragalus parts. Now we can try assembling the whole set, so see how it looks. 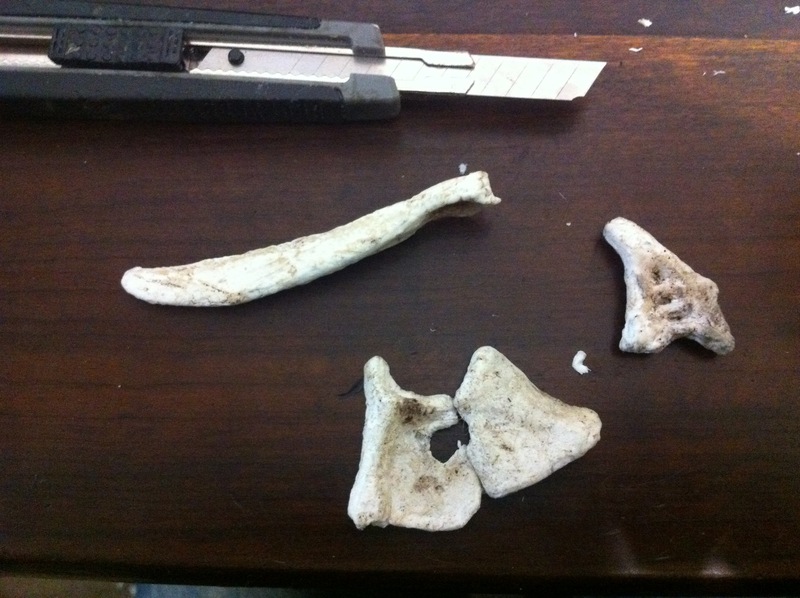 In the upper part of the image below is an unassembled pelvis, a femur and a tibiotarsus, and at the bottom an assembled pelvis with an articulated femur and tibiotarsus. Here I tried to fit them in place with my fingers. But it’s easier with pins. 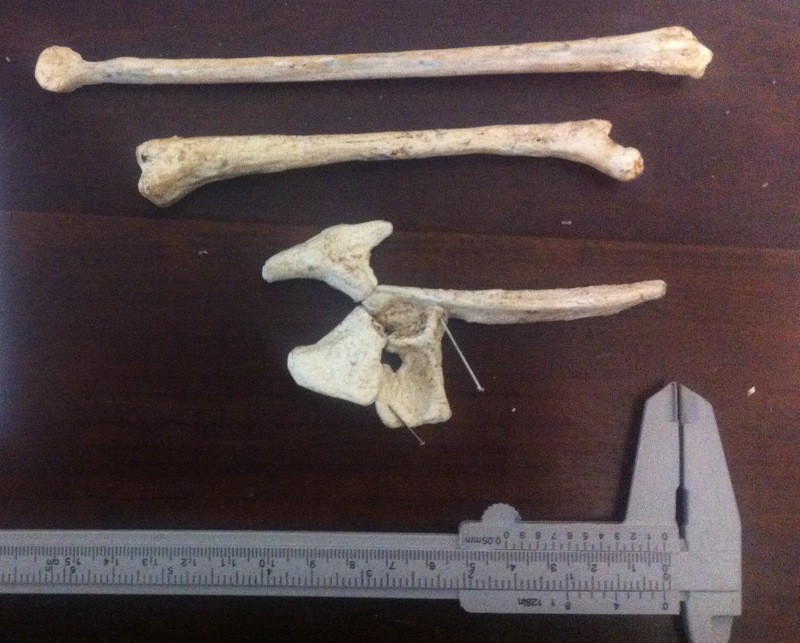 The image below shows a tibiotarsus, femur, and an assembled pelvis. 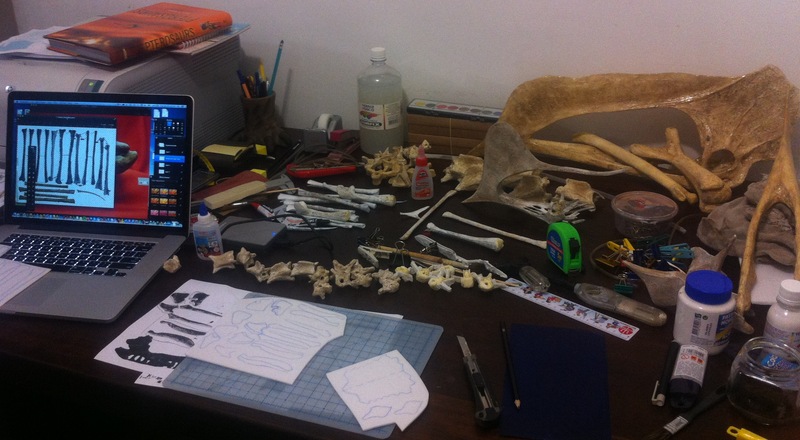 There is still a lot of work to do on the pelvis, and I should return to it next week when I will try to connect them to the sacrum, and finish the pelvic girdle.